Your Megas are just the best! I can't pick a favorite! these are all wonderful, I especially love masquerain's design! wooooo this mega Masquerain is wonderful!!!! Love these concepts. Would totally have Masc and Butter in my team! 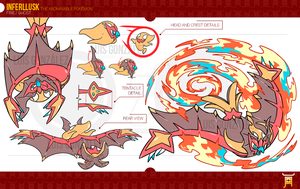 the masquerain mega is the best. These are so pretty!! I especially like Mega Butterfree and Masquerain! I also think those two are the most beautiful! Damn, those are all amazing. The extra effort you put in with the shinies really is outstanding. 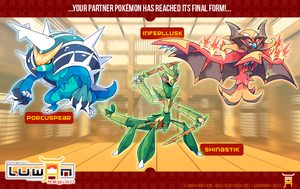 The things I would do for that Mega Ledian and Mega Masquerain though. Such cool movesets they could have and Butterfree becoming Bug/Psychic would really make it stand out. Also dee-lee-lee-lee-whoop intensifies. If I had to guess what Magical Wing does, it would give priority to Psychic-type moves, while Bug Symphony could be like Primarina's Liquid Voice, where sound-based moves would change type, in this case Bug-type. Now if only we could have all these in the games. Take notes Gamefreak, take notes. how cool do know if the real ones or fake ones? Gah! I wish these were real! Your Mega Kricketune is way better looking this its normal design. I still consider Kricketune to be the ugliest Pokémon. Even its game call is creepy. Mega Butterfree is adorable! I always thought that it deserved the psychic typing too! I love Butterfree's cloth and Ledian shoudl be an official design. It needs this mega! Congratulations! Can these be real please? I want - no! I NEED these to be real! Holy crap, I want all of these to be real. Especially Masquerain, it looks so beautiful. Accelgor. I assume you're discounting Pokemon that don't evolve, but there's also Pinsir, Illumise and Volbeat. It no big deal. There's +800 of these little guys now, no one could remember every detail about all of them. I used to always forget that Steel was weak to Ground, and I still forget which Pokemon have Levitate. I'm not of the ones that would like to give mega evolutions to bug type pokémon like this but these mega evolutions are wonderful, specially the Mega Masquerain, it's design is awesome! THE OTHERS ARE GOOD TOO, BUT THE LEDIAN IS THE BEST ONE! I absolutely love Kricketunes Mega here! At whole all designs are so well done. hats up! What are their abilities, if i may ask? And what do Magical Wing and Bug Symphony do? When sound-based moves successfully used by the Pokémon with this Ability,it has a 75% chance of raising the user's Special Attack, Special Defense, and Speed by one stage each.